If you’ve followed me for any time on Facebook or Twitter, you’ve heard me talk about Teen MOPS. Teen MOPS is a support group for teenage mothers. It’s part of MOPS International. Basically Teen MOPS is a support group for our youngest moms. I started a Teen MOPS group in Kalispell, Montana, in 2000. After moving to Little Rock last year, I started a group here, too. 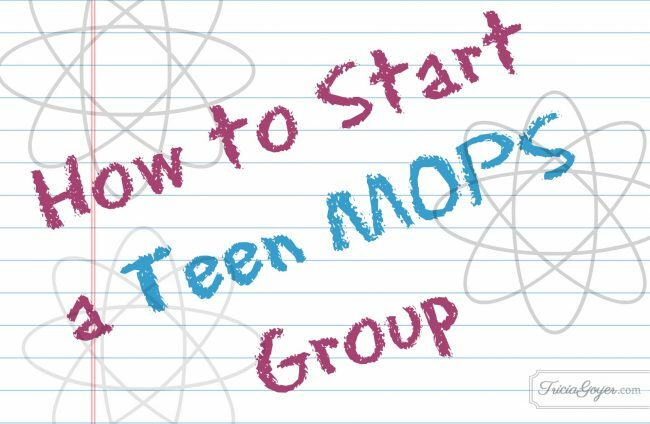 If you’d like to find out how to start a Teen MOPS group, go here. Teen MOPS is run by volunteer leaders. They can be women with young kids or older kids. We’ve had volunteers that don’t have kids yet. Volunteers can be retired women or women in college. We even have high schoolers who help with child care and other needs we have. I got involved in Teen MOPS because I was a teen mom . . . but you don’t have to be a former teen mom to volunteer. Women who volunteer do so for various reasons. You just need to come to the meetings with an open heart and outstretched arms. After I started a Teen MOPS group I realized there was a need for a book just for them. That’s why I wrote Teen Mom:You’re Stronger Than You Think. I also wrote a leader handbook as well as a free companion workbook and group guide! Contact MOPS International for information about a charter. Plan the meetings. Teen MOPS groups usually run on a school year schedule from September–May. Be patient. When Teen MOPS starts it may take a while to grow a group. We often start with two-to-five girls each meeting.